Another treat for loyal fans: Our favorite British royals seen in a single frame! 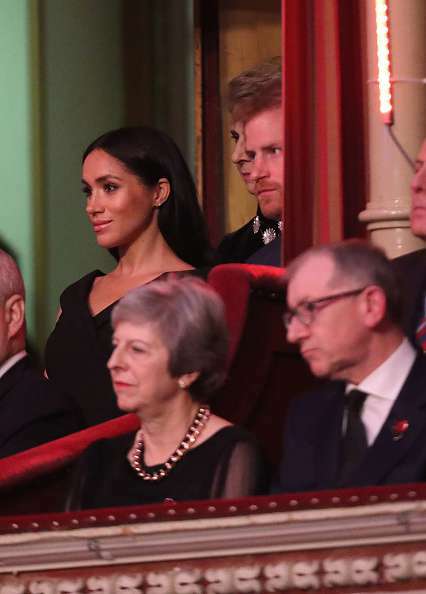 Last Saturday, Prince Harry and Meghan Markle, along with Prince William and Kate Middleton, the Queen, and other members of The royal family for the Royal British Legion's annual Festival of Remembrance at the Albert Hall. The evening was dedicated to honor all those who lost their precious lives in patriotic conflicts. Their November tribute is now consolidated! All attendees wore black as a symbol of grief and devotion, and so did the Duchesses of Cambridge and Sussex! The Cambridge beauty wore a chic black outfit by Roland Mouret, which is also one of Meghan beloved designers. She looked sleek and poised as she sided with Prince William, thanking the fallen ones who sacrificed, served, and altered Britain. From her stunningly coiffed hairstyle to her subtle choice of the clutch and her black heels, the Duchess looked elegant and classy during the event. And the unusual neckline suited her flawlessly. This event marked the Duke and Duchess of Sussex's first engagement with the royal family after their Oceania tour. Meghan chose a black Stella McCartney coat for the poignant occasion and hid her dress underneath, along with her ever-growing baby bump. Following Kate's ensemble, she was also wearing matching black heels. She charmingly smiled at onlookers, which reflected her jubilant mood! The two ladies completely complemented each other's looks for the commemorate affair! Share this if you agree both of them are unquestionably magnificent!